Kiojo® is one word that is made from two words and was coined by its founder Jim Holcomb. Kiojo® means Harmonizing of energy. 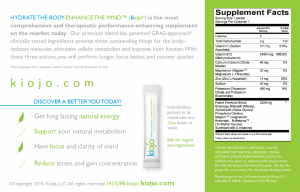 It works like this: Ki is an eastern word meaning Life Energy, and M(ojo) is a western term meaning Self-Confidence. When You apply Ki and M(ojo) to your life, you are in Harmony with these two energies! You+Ki+M(ojo)= Kiojo®! The potential YOU! Are you resonating with your life? Follow the Kiojo Lifestyle blog for tips and ideas that can help you with harmonizing your life. What ingredients are in Hydrate the Body-Enhance the Mind™? Hydrate the Body-Enhance the Mind™ is a blend of superior plant based nutritional ingredients infused with natural nutrients that nourishes both the brain and the body. What makes Hydrate the Body-Enhance the Mind™ unique from other dietary supplements is that we use the highest quality ingredients available in regards to purity and scientifically formulated with ingredients that are backed by clinical studies for their effectiveness, claims and functions. The product is packaged in single serving stick-packs to preserve freshness and for its “on the go” convenient use. Each ingredient selected is of the highest quality available and water soluble for ease of digestion for maximum absorption and effectiveness. Bioenergy ribose, Magtien (magnesium threonate), AlphaSize (Alpha-GPC) NuBetaine (betaine tmg), Suntheanine (pure L-theanine) Potassium Bicarbonate, Potassium Citrate, Methylcobalamin (B12), Sodium ascorbate (vitamin C), Calcium Citrate Malate, Zinc L-aspartate. It contains No Caffeine or Guarana, No Stimulants, No artificial colors, flavor or sweetener. No preservatives, No milk, No lactose, No wheat, No yeast, No MSG, No gluten, No fish, No soy proteins, No worries. OTHER INGREDIENTS: Natural flavors, Organic Stevia Extract (stevia rebaudiana) (LEAF), Organic Erythritol, AlphaSize® is sourced from soy lecithin and contains no soy proteins or soy isolates. How Is Hydrate the Body-Enhance the Mind™ made? The ingredients for Hydrate the Body-Enhance the Mind™ are made from the highest quality available. It is manufactured in the USA in a FDA registered facility under stringent GMP (Good Manufacturing Practices) standards. The ingredients are measured and blended to exact specifications and are tested for safety with Certificates of Analysis for each ingredient for its purity and safety. As with all dietary supplements it is advised to consult your Doctor before use. Hydrate the Body-Enhance the Mind™ has the same amount of Potassium as a banana. Do not use the product if you are on a Potassium restricted diet. It contains No Caffeine, No Stimulants, No artificial colors, flavor or sweetener. No preservatives, No milk, No lactose, No wheat, No yeast, No MSG, No Gluten, No fish, No soy proteins, No worries. 1 Add to 12oz of water, add ice and a lemon slice. 2 Add to 12oz of unsweetened tea, add ice and a lemon slice. 3 Add to 12oz of natural sparkling mineral water, add a lemon slice for a nice carbonated beverage. (naturally carbon mineral water works better than CO2 carbonated beverages) ENJOY! Hydrate the Body-Enhance the Mind™ is infused with natural flavors. It has a fruity taste. Is this your typical acid type beverage that is hazardous to my teeth enamel? Not at all, Hydrate the Body-Enhance the Mind™ is PH balanced like water and not acidic like most other drinks. It contains no sugar or artificial sweeteners that can cause tooth bacteria. In fact the Organic sweetener used in Hydrate the Body-Enhance the Mind™ is Erythritol and early studies have shown that it actually may help in preventing tooth decay and does not raise blood glucose or insulin levels. Hydrate the body-Enhance the mind™ is the most advanced hydration supplement on the market! Our science based blend of superior natural ingredients are the highest quality available and backed by clinical studies for each of their function. Not only will you Hydrate your body with essential electrolytes but Enhance your mind as well. 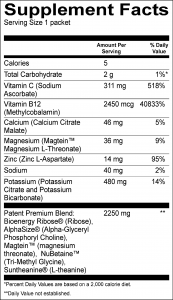 Using this unique formula some of your current supplementation may be replaced as well. Our approach for the creation of Hydrate the body-Enhance the mind™ is to use the highest quality nutrients available that have been clinically researched and tested for their specific functions for the body and brain. To achieve this core principal, we invested our time and resources working with innovative companies who are making new unprecedented discoveries in nutrition with regards to nutritional science. The key to this formulation is to analyze each ingredient for its synergistic value when combined with the other ingredients in our formula. What this means is one ingredient must enhance the other and work together in harmony (Kiojo) to achieve the purpose of the formula as a whole. Hydrate the body-Enhance the mind™ refuels the body and brain naturally and safely without the high-calorie sugars, stimulants or artificial additives by providing the nutrients and electrolytes it loses through daily mental stress and physical activity. This supplement is for anyone who wants to be focused and stay calmly energized naturally throughout the day without the feeling of jittery stimulants so you can always be at the top of your game. How long does it take before I feel any benefits from the drink? Some individuals experienced an immediate calm feeling just after a few sips! Others have experienced that the nutrients start working within 10 minutes with an increase in subtle energy and mood. You will stay focused and energized with each sip! Studies for the patent protected ingredients have shown that the brain nutrients increase cognitive functions when used regularly. There is not a set schedule for taking this amazing dietary supplement, however it is best to sip the drink slowly this way the body is able to absorb the nutrients on a steady basis. An active lifestyle may want to take one serving just before a your event and one after to help with recovery. The ingredients are all water soluble and any access will flush out of the body. I am a Vegan, Vegetarian, can I use this product? Yes! Hydrate the Body-Enhance the Mind™ does not contain any meat, dairy or animal products. In fact, because of the B12, Zinc and Choline (Alpha GPC) in Kiojo, it would be very beneficial to use on a daily basis. The ingredients say non protein soy lecithin, is there any soy in the product? There is no soy in Hydrate the Body-Enhance the Mind™. The ingredient AlphaSize (alpha-GPC) is a nutrient derived from soy lecithin and through a patented process the ingredient is isolated from the soy and removes any soy proteins and DNA markers. Why is there so much B12 in Kiojo? B12 is one of the hardest vitamins to absorb into the body and studies have shown that healthy people only absorb about 1% of the B12 that is supplemented orally. So the bottom line is with 1 serving of Kiojo you may get only about 4 times your daily RDA.